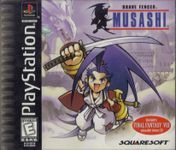 The player controls Musashi, who fights a variety of enemies using his swords Fusion and Lumina to save the kingdom from various threats, and who searches for five scrolls which will increase Lumina's strength and grant him new abilities. The game also features an in-game clock and day-night system that affects the townsfolk and some of the creatures in the field as well as forcing the player to pay attention to Musashi's fatigue rating that goes up over time with lack of sleep.Along the way, Musashi obtains parts from the Legendary Armor which allow him to perform actions such as climbing or performing double jumps.The two swords he uses also have varied abilities and uses. There are also several minigames and puzzles scattered throughout which must be completed to advance the plot.